Canadian Foreign Minister Chrystia Freeland says her country would "always stand up for human rights around the world"
Canadian Foreign Minister Chrystia Freeland refused to give ground in a dispute with Saudi Arabia on Monday, saying her country would "always stand up for human rights around the world". 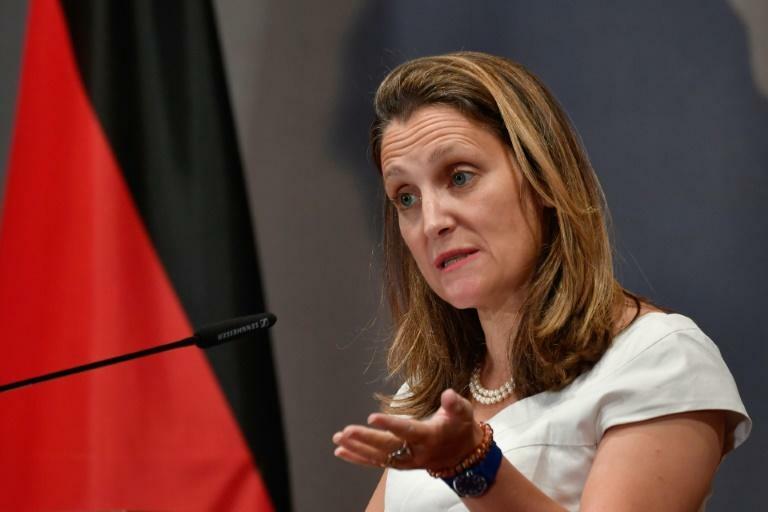 While she did not cite the kingdom by name, Freeland told a gathering of German diplomats in Berlin that "Canada will always stand up for human rights around the world, very much including women's rights." That would hold true "even when we are told to mind our own business, or that matters such as these should only be discussed in private, between leaders, behind closed doors. And even when speaking up brings consequences," she added. Ottawa and Riyadh are at loggerheads over Canadian criticism of Saudi Arabia's human rights record. Earlier this month the Saudi government expelled Canada's ambassador, recalled its own envoy and froze all new trade and investments after the North American nation denounced a crackdown on rights activists there. "We count on and hope for Germany's support" in defending human rights, Freeland added.